191 pages, 8.5” x 11”, full color, spiral bound; includes comprehensive color charts and samples; basic skills; making simple, complex, and murrine cane; process sequence images of human figures and elements of the natural world; underlying principles as well as practices; problem solving; resources and a complete index. 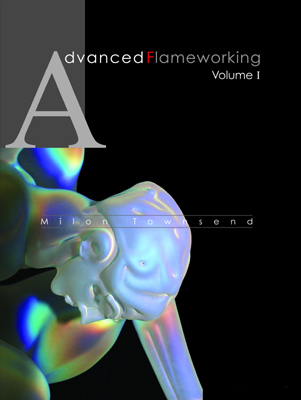 Written by a master of borosilicate flameworking still working 12 hours a day, this is an eminently practical approach using thousands of photographs to clearly illustrate exactly how to go about successfully making glass sculptures in the torch. Very limited quantities available, this is a collectible volume. Signed by the author.